KUALA LUMPUR, Malaysia, September 20, 2017 – Ford Motor Company and its local distribution partner, Sime Darby Auto Connexion (SDAC), today announced the nationwide launch of the tough, efficient and capable Ford Ranger XL Standard pickup truck. Priced at RM83,588 on the road without insurance in Peninsular Malaysia and RM89,388 in East Malaysia, the Ranger XL Standard is one of the best priced models in Malaysia's 4x4 hi-rider pickup truck segment. Ranger XL Standard is available in two colours, including Cool White and Meteor Grey, and offers unmatched capability and comfort. 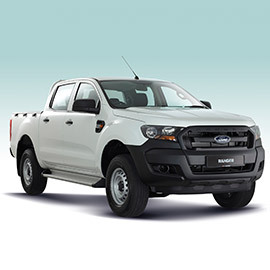 With a class-leading ability to wade through water up to 800 mm deep, and with 230 mm of ground clearance, the Ranger XL Standard represents everything consumers are looking for in a pick-up truck – whether for work or play, or a combination of both. To balance power and fuel efficiency, Ranger XL Standard is powered by four-cylinder 2.2L TDCi diesel engine, putting out 125PS of power and 320Nm of torque, while its 6-speed manual transmission and 4x4 shift on the fly (ESOF) give drivers ultimate control on the road to take on any challenges – be it river crossings, muddy slopes or other off-road terrain. Beyond its tough exterior, the Ranger XL Standard is equipped with a range of safety features. It has a reinforced safety cell that is supplemented with dual front airbags, as well as head restraint and 3-point safety belts across all five seats. For details, phone 1300 38 3181.